For Guest posts or some help on specific problems please leave comments or Email me from Contact Us page!. checking motherboards for faults is quite hard, but i don't believe this it is the most easiest task to check for faulty motherboards check for the capacitors see if they are puffed up? 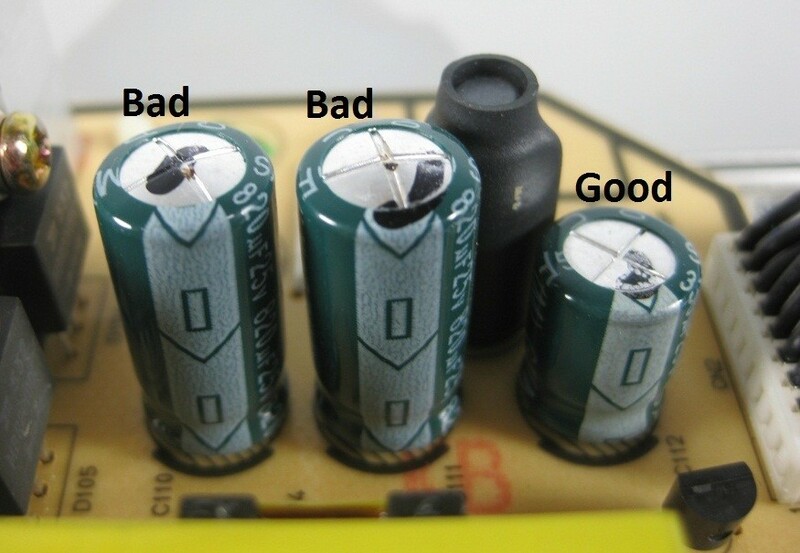 a puffed up capacitor is bad where as a flat capacitor is good, if you see a single puffed up capacitor consider to change your motherboard or if you can repair it on your own then its good because many repair centres don't want to repair them and if they do they charge a hefty amount of Rs 500 to 1500, where as if you do it on your own it might cost you not more than Rs 150.
after a few years of operation the gears of the CD drive wear out this is why the CD tray couldn't come out on its own, you might think of changing the Drive but there is a simple work around present, take a safety pin and if you closely observe a CD drive you might see a small hole near the button press the button and put the safety pin in that hole and push it a bit the tray should come out now. a HDD may go wrong anytime but to predict its fault can be life saving for you as an HDD contains lots of data so to transfer it before the "apocalypse" happens one thing to notice is constant sound from the HDD, as it signifies that the platters are unstable now. a Monitor fault can happen from numerous ways one of them is a electrical surge or damaged VGA pins, in the later case you need to change the VGA cable and if the power cable houses a fuse just change it, otherwise its time to change your Monitor. Keyboards also may not work due to damaged PS/2 pins or if some rat chips off your cable, in either case change your keyboard. From my personal experience i have observed that there are 99% less chance of a RAm getting faulty so i think you don't need to worry about that. there are only two conditions for a processor either it will work or not there is no middle way for it, and there are less chances of the faulty processor as it may go wrong due to over heating or overclocking but the modern processors are developed with fail safe technologies in mind by taking care of cutting power at really high temperatures such as 95'C . So no need to worry for that. So I think you must have figured out the faulty hardware by now. before you buy a new hardware make sure to check for warranty of your existing hardware and in the next purchase check the compatibility and flexibility of the hardware too.